The Men in Blue fired from all corners to let their rival teams down in all departments of the game under the inspired leadership of their legendary captain, MS Dhoni. Their batsmen proved to be the best during the entire tournament and the bowlers bowled excellently whereas the acrobatic fielding supported them in each and every match. India won their pool matches with a reasonable margin against strong units such as South Africa, West Indies and Pakistan. They won the semi final vs. Sri Lanka by a huge margin of eight wickets on June 20, 2013, at Sophia Gardens, Cardiff. 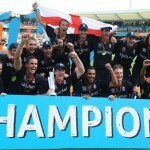 The final was played on June 23, 2013, at Edgbaston, Birmingham, and the Men in Blue defeated the hosts England by five runs in an interesting battle. Shikhar Dhawan and Ravindra Jadeja were the super stars of the ICC Champions Trophy and the rival teams were stunned by the performance of the two young guns of India. Below, we will highlight the performance of the two players in the event. 1- Vs. South Africa – 114 runs (94b 12×4 1×6), ‘Player of the match’. 2- Vs. West Indies – 102* (107b 10×4 1×6). 1- Vs. South Africa – batting, 47* (29b 7×4 1×6), bowling, 2-31 in 9 overs. 2- Vs. West Indies – bowling, 5-36 in 10 overs, did not bat, ‘Player of the match’. 3- Vs. Pakistan – bowling, 2-30 in 8 overs, did not bat. 4- Vs. Sri Lanka – (semi-final) bowling, 1-33 in 10 overs, did not bat. 5- Vs. England – (final) batting, 33* (25b 2×4 2×6), bowling 2-24 in 4 overs, ‘Player of the match’.